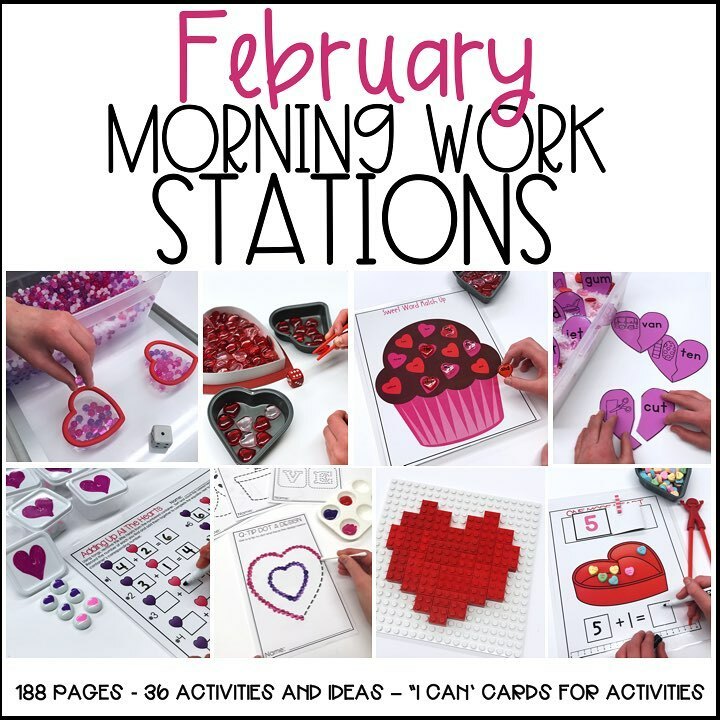 On this page, you will find a product list by month of items used for my morning workstations. 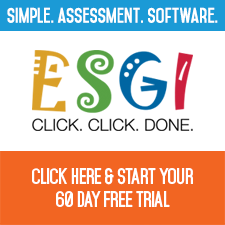 You will want to scroll down to find each consecutive month. There are links to many items here if you need help finding them. Just click on the item name and if it is highlighted in a different color, the link will take you to where you can purchase the item online. Readers are always asking me where I collected all the tools and goodies that I use for Morning Work Stations. To make things a bit easier to find, I created this page with a list of the materials and tools you will need. Most of these are things you will probably have lying around your class. However, in case there is one or two items you may need, you can just click on the item listed below and you will be directed automatically where you can get these items. Some of these items have affiliate links to Amazon and/or DollarTree. I do receive a small affliliate payment for these referrals which help me maintain and cover the expenses to keep this blog running. 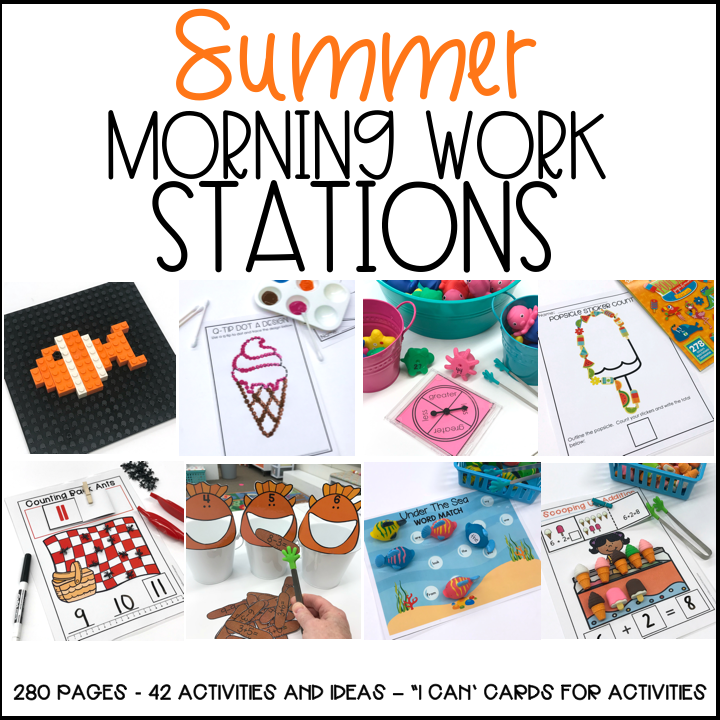 The activities below are the ones included in my Getting Started with Morning Work Packet. I have listed all the materials and tools you will need. 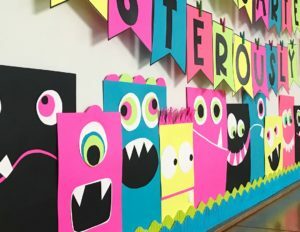 Additionally, you will want to have access to a laminator, laminating sheets, colored Astrobrights paper, scissors and a stapler to put your activities together. And that is all that you need for this first set of Morning Stations. If you have questions, please do not hesitate to contact me. I have used these stations in my own room for several years so I have tons of experience with any roadblock or question that may occur. 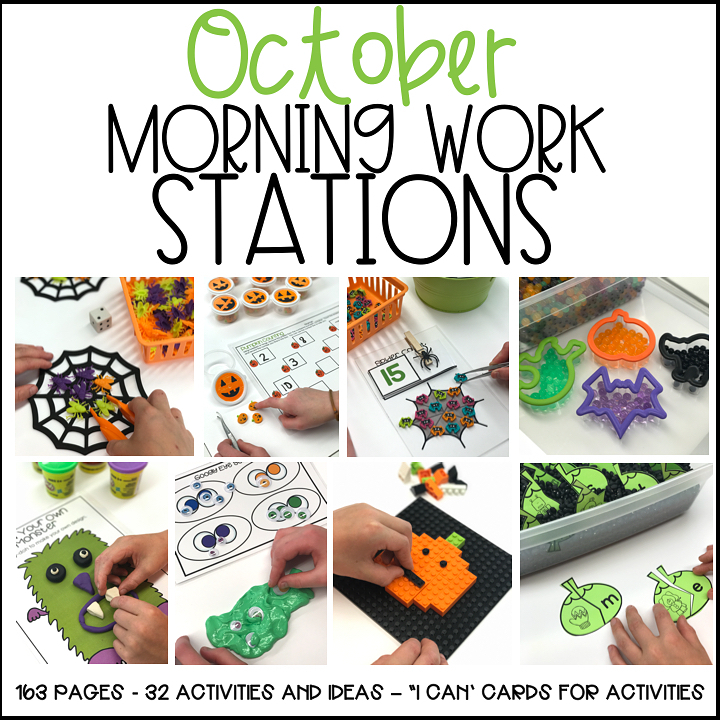 The following is a list of items used for October’s Morning Work Stations. Tracing and cutting sheets -available in the packet. Thematic colored paper straws – You can find these at Walmart or Hobby Lobby. Pokey Pin pages for Halloween – available HERE as a freebie. Transparent Spinner – I hot glue my transparent spinner to a CD case and slip my spinning card inside. Clay – Put this is the bottom of the class to act as an anchor and a weight so it doesn’t fall over. 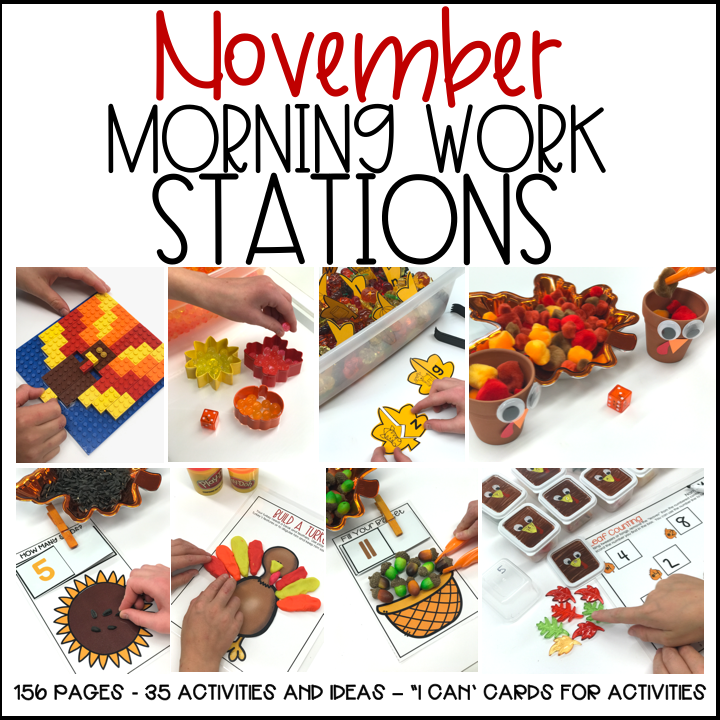 The following is a list of items used for November’s Morning Work Stations. Small acrylic acorns in green, brown and orange (I got mine at Hobby Lobby). You can also use pony beads or buttons in these colors. Thanksgiving Storybook Easy Reader included in this set. 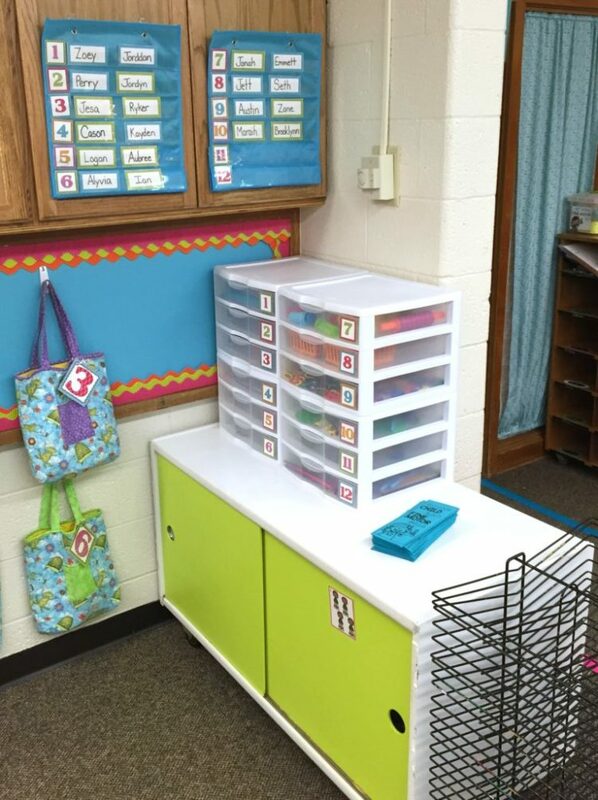 Remember, there are a lot of stations to choose from, so if you can’t find an item, you can choose a different activity or substitute materials as needed. I did my best to use items from the Dollar Tree when possible. I have added links where possible. So just click on The item if highlighted to find where you can get yours. This post does include affliate links. If you happen to purchase an item from these links, I receive a small commission which helps maintain the cost of upkeep on this blog. However, I only promote items that I personally use myself and love. Peppermint Stick and Sand Sight Words Trays. Salt with peppermint extract (and food coloring of your choice) added. Playdoh Counting and Making 10 Math Mats. Ornament Grab, Spin, and Win. Fill Your Sleigh self-correcting cards printed on cardstock, laminated, and secured with clothespins. Small thematic stickers – Any kind of small stickers will work. Thematic cookie cutters. You can find these at Dollar Tree. If you can not find the miniature containers at the Dollar Tree, you can always use any small container. Even something like a small clear container that you get for to-go salad dressing would work. Just stick a little holiday sticker on the top to differentiate between the two different types of containers that you will be using. Recording mat printed on cardstock and laminated (I have included two options here. Small Target erasers: Santa and Candy Canes. Recording sheet printed on cardstock and laminated. Self-correcting cards printed on cardstock, laminated and folded to hide the answer. Flat glass marbles (Available at the Dollar Tree) that are programmed with sight words of your choice. 2 pieces of 12 x 12 (or a large flat piece such as that) Styrofoam with a pine tree painted on the top. Several white golf tees placed on the tree for balancing bulbs. 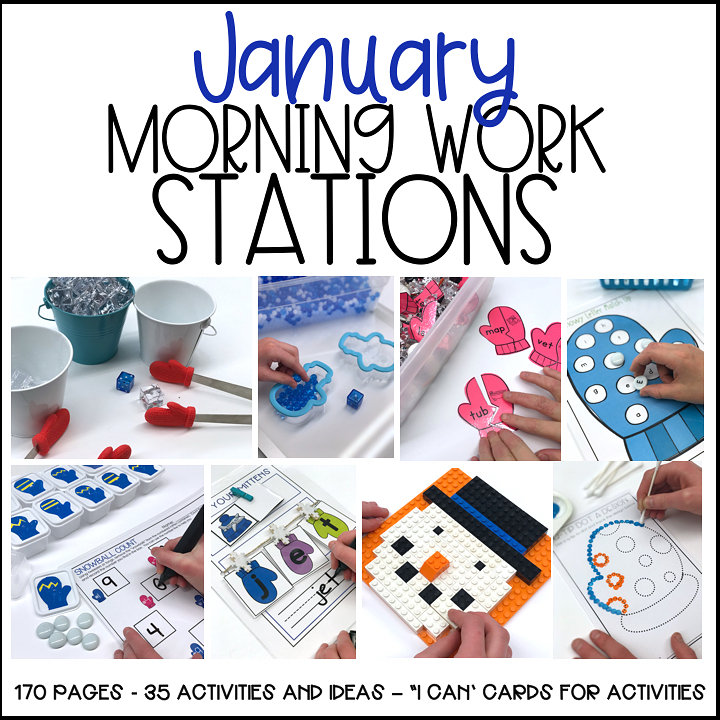 Here is a tentative list of activities and materials that will be used in January’s Morning Work Activities in case you are interested in getting a head start. I have linked some places where you can secure these items, but often you can find them at Hobby Lobby, Dollar Tree, Walmart and Target. Just keep your eyes peeled. Counting marshmallows self-correcting cards printed on cardstock, laminated, and secured with a clothespins. Winter transparent table scatter and purple, clear, turquoise, and/or blue flat marbles. Small dollar store containers. You can find these on Amazon, but if you can get them at the Dollar Tree get them there because they are so much cheaper. I just found a bunch so they should be in stock. Small Target erasers: Snowmen and Penguins (or make these using flat black and white flat marbles). Flat white glass marbles that are programmed with sight words of your choice. Sight word fish, laminated and having a brad through each eye. Ping pong balls programmed with letters. Snowball sight word cards (included in this set). Sensory bin with thematic items. 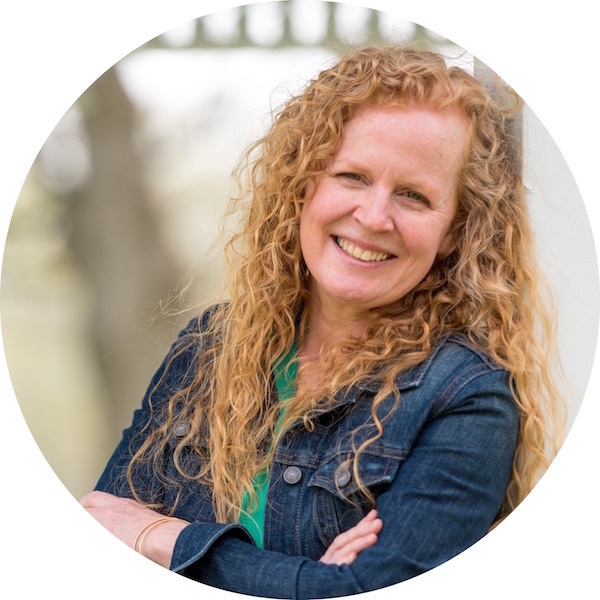 Plastic pink and read table scatter hearts from the Dollar Tree or Amazon. Empty candy boxes or thematic buckets or heart shaped pie tins. Fill Your Heart self-correcting cards printed on cardstock, laminated, and secured with a clothes pins. Self-correcting cards printed on cardstock, laminated and secured with a clothes pin. Small thematic stickers or any small stickers you can find. If you are interested in the colored heart stickers, I found those HERE, last year or you could just use small colored circle stickers too. There are equations from 0-5 and others from 5-10. Select and print off the pages you wish to include, staple and cut in half. Please note, if you can not find heart paper punches, students can also use stickers or heart stamps instead. Small heart-shaped pink and purple buttons, beads, erasers or heart painted on flat marbles. Sweetheart brand Conversation Hearts(You could use flat black or white marbles with heart shapes painted on them in them in orange, yellow, pink, purple and green. Flat pink or red colored hearts or flat white glass marbles with hearts painted on them that are programmed with sight words of your choice. Thematic items including poly beads, plastic hearts or acrylic jewels in pink, red, and purple. Heart shaped buttons and/or beads. Several differently keyed lock and key sets. I buy mine individually from discount and dollar stores. Do not buy a ‘lot’ of keys as they will be keyed all the same way. You can also ask parents to donate any old, unused locks and keys. It’s a great way to assure they aren’t all keyed the same way. Yarn or pipe cleaners to make a web. Paint hearts on one side and letters (or words) on the other. 1.Pot of Gold Sight Word Links. 2. Somewhere Over The Rainbow CVC Self-Correcting Cards. 3. Linking Lucky Numbers and Quantities. 4. Rainbow Sand Tray Sight Words. 5. 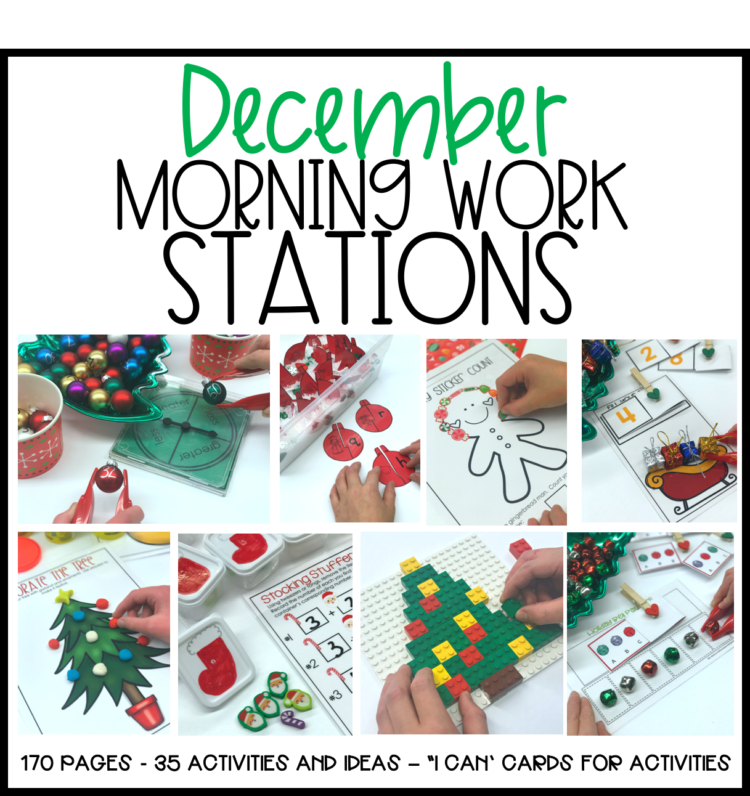 Fill Your Pot Counting Math Mats. Dough for making number and pieces of ‘gold’ to fill your pot ‘box.’ Gold can be yellow pompoms, play-doh or gold coins. 6. Luck of the Irish Ten Frame Mats. 7. Luck of the Irish How Many More To Make Ten. 8. St. Pat’s Dough Pictures. 11. Colors of the Rainbow Therapy Putty Sort. 12.Colors of the Rainbow Sort and Graph. 13. Colors of the Rainbow Sort Find, Sort, Graph, And Count. Please note: I also added a Hidden Shamrock version of the above stations. With these stations, I found a plastic St. Patrick’s Day necklace and cut the beads off. I hid the different sized shamrocks and balls in my therapy putty. It’s just another option for you to consider. Enjoy! 14. Race To Fill Your Hat. 15. Fill Your Pot (0-10). Fill Your Pot self-correcting cards printed on cardstock, laminated, and secured with a clothespin. 16. Fill Your Pot With One More. 17. Empty Your Pot With One Less. 18. Lucky Spin To Win. Small thematic stickers or any small stickers you can find or you can use colored sticker dots. If you can’t get shamrock paper punches you can always use stamps. 24. Gel Bead Sort By Color. 25. Gel Bead Roll and Win. 27. St. Patrick’s Day Straws Cut and Thread Necklaces. 28. Lucky Constructing Letters And Words. 29. Rainbow Containers Count and Record. Small Dollar mini white Surerite containers with rainbows painted on the lid. 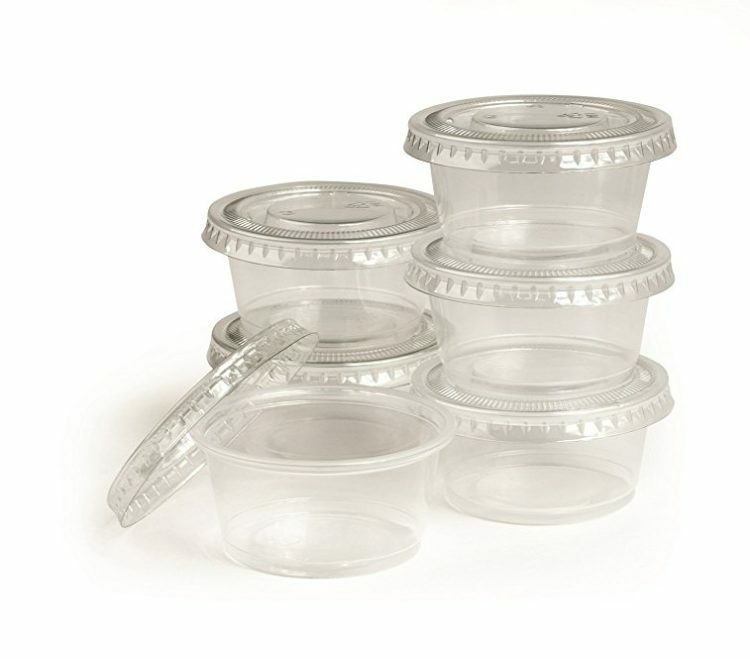 (Or you can use those mini plastic pots, but I like the lids because they have a top and the pots do not. Small rainbow erasers, buttons, beads, pompoms, Skittles or I painted flat white marbles with rainbows. 30. Pot of Gold Add and Record. Plastic green and gold colored coins (or you could use buttons, pompoms or beads of the same color. 33. Leprechaun’s Gold CVC Word Puzzles. 34. Leprechaun’s Gold Blend Puzzles. 38. Unlock your Luck Math. 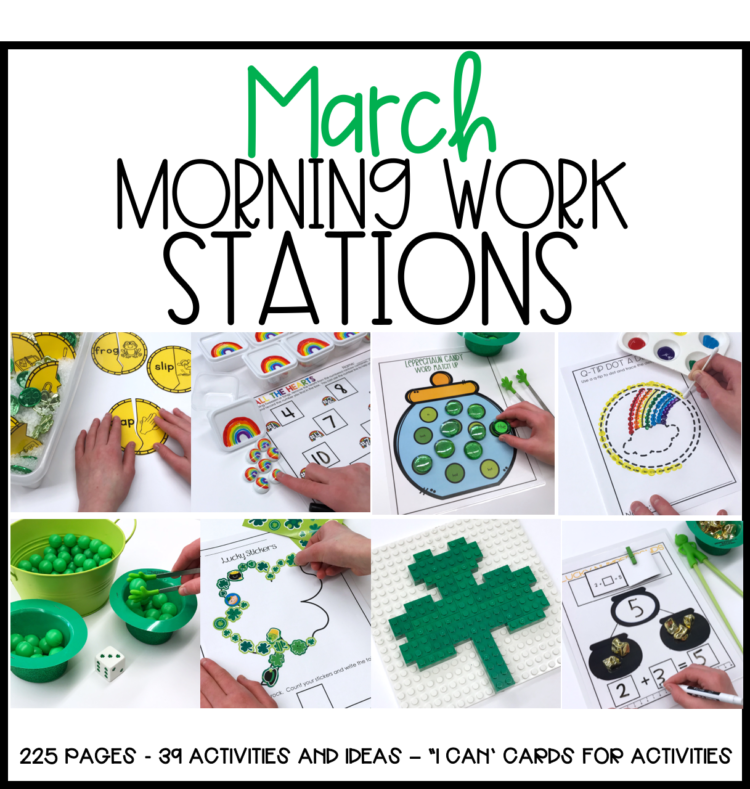 Thematic items including poly beads, shamrocks, horseshoes and gold coins. Small Basket with holes on the sides. I got mine at the Dollar Tree. Paint clovers on one side and letters (or words) on the other. On one, paint just one shamrock and not words. Spring Umbrella, Kite and Egg Mats. Every Bunny Loves Carrots self-correcting cards printed on cardstock, laminated, and secured with a clothes pins. Mini rubber ducks with numbers written in permanent marker on the bottom. Small Dollar mini white Surerite containers with your choice of a springtime item. (I’m painting baby chicks on mine.) You can also use the Dollar Tree Chick containers if you prefer. Small egg erasers (I found mine at Target), buttons, beads, pompoms or jellybeans. Recording sheet printed on cardstock and laminated. I have given you a couple of different options. One has bunnies and eggs, another has bunnies and carrots and another has pink and blue bunnies. If you ct find bunny manipulatives, you can always use pompoms as bunny tails. Pompoms, buttons or beads in pastel colors. Flat blue glass marbles programmed with letters of your choice using paint pens or round stickers. Flat blue glass marbles that are programmed with sight words of your choice. Thematic items including poly beads, spring confetti, spring tables scatter. Sensory bin with dried green peas or other thematic items. Plastic eggs. Place a heavy magnet and non-harding modeling clay in the bottom. This will make the egg stand up on the cookie sheet. Place a letter on each egg for spelling sight words. Mini spring erasers from Target Dollar Spot (or other manipulatives that have bunnies, chicks, carrots and eggs). You can also get some similarly themed erasers on Amazon here. Count Your Bugs self-correcting cards printed on cardstock, laminated, and secured with a clothes pins. Small Dollar Store mini white Surerite containers or other small containers with your choice of a garden item painted on top. I’m using bees on small black containers. Small dollar Surerite store containers or another small container. Dough for making number and melon seeds. Count Your Ice Cubes self-correcting cards printed on cardstock, laminated, and secured with a clothes pins. Plastic ice cubes, white buttons, pompoms or marshmallows to represent ice cubes. Playing mat printed on cardstock and laminated for durability. Mini toy sea creatures with numbers written in permanent marker on the bottom. Small Dollar mini white Surerite containers or other small container with fish painted on top. Small Dollar mini white Surerite containers (Dollar Tree) or other small container with fish painted on top. 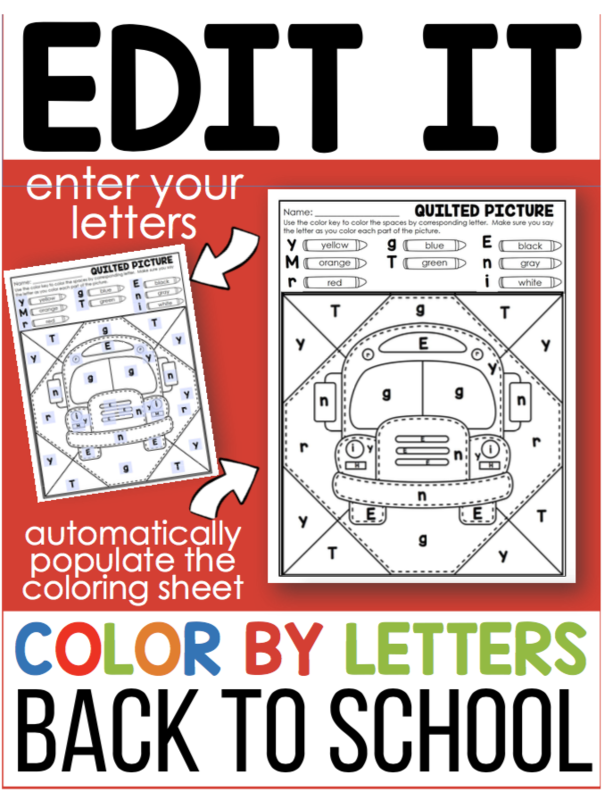 Digraph/Picture puzzles pieces printed on cardstock and laminated for durability. Rubber fish (You can get these at Dollar Tree or there are some available thru Amazon.) or small toy fish that are programmed with sight words of your choice.